Residents celebrate in Kinshasa, Jan. 10, 2019, after learning that opposition presidential candidate Felix Tshisekedi has been declared the winner of the elections. 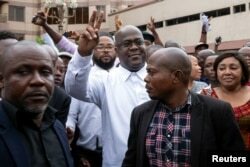 Election officials in the Democratic Republic of Congo have sparked surprise and outrage by naming opposition leader Felix Tshisekedi the winner of the nation's presidential election, after counting delays and a poll marred by irregularities, rampant suspicions and chaos. “This attitude from the electoral commission raises various legitimate suspicions that fuel political tension throughout the country,” Fayulu said. The influential Catholic Church, which sent more than 40,000 observers to the polls, also disputed the official result, saying, “the results of the presidential election as published by the CENI do not correspond to the data collected by our observation mission from the polling and counting stations." Felix Tshisekedi, leader of the DRC's main opposition party, Union for Democracy and Social Progress (UDPS) who has been declared the winner of the presidential elections, gestures to his supporters in Kinshasa, Jan. 10, 2019. “The electoral victory of opposition leader Felix Tshisekedi is highly surprising, but the decision makes sense in the context of DRC’s political dynamics,” EXX Africa Business Risk Intelligence wrote in a report shortly after results were released. Opposition candidate Martin Fayulu wipes his face before speaking to the press at his headquarters in Kinshasa, DRC, Jan. 10, 2019. 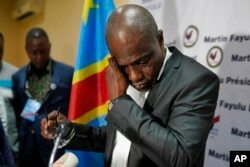 Fayulu, who came second in the presidential poll behind Felix Tshisekedi, called the results fraudulent. 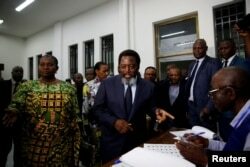 DRC President Joseph Kabila smiles as he arrives to vote at a polling station in Kinshasa, Democratic Republic of Congo, Dec. 30, 2018. Amos Wangwa contributed to this report from Nairobi.